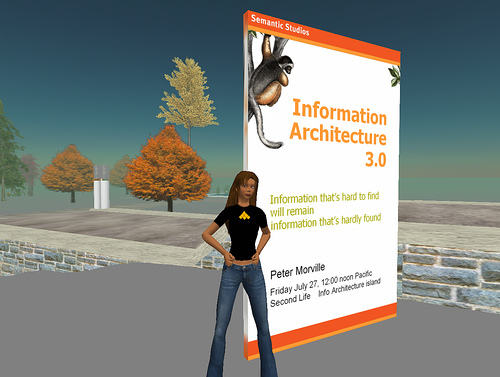 The Information Architecture Institute (IAI), a professional membership organisation, has created an Info Architecture island on Second Life. Andrew Hinton‘s “Architectures for Conversation: What Communities of Practice Can Mean for Information Architecture” was the inaugural event on IAI’s new Second Life island. You can download snapshots, transcript and slidedeck. Next in line was Peter Morville (blog). In his talk “Information Architecture 3.0“, Peter drew upon stories, examples, case studies, and discussions to explore the future present of information architecture. Also here you can download snapshots, transcript and slidedeck. Session three is on 2 August with the talk “Search Engine Optimization and Information Architecture – The Makings of a Beautiful Friendship” by Marianne Sweeny. Marianne will talk about what is going on behind the scenes of today’s search technology, what is in the pipeline for tomorrow’s search technology and how information architects can work with this technology to create optimal online wayfinding systems.